Tea & Gossip is a cute little café in Vasant Kunj which serves some excellent teas and is a great place to work from. Looking at some time to unwind and sit around with your friends and gossip over some freshly brewed chai? Well, head to Tea & Gossip, situated right next to Nanking and spend some fresh quality time. 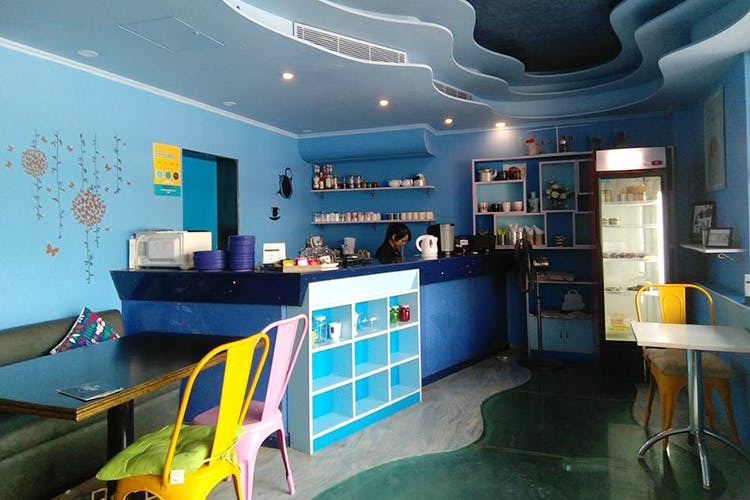 With warm and soothing blue walls and painted colourful chairs, this place makes for a calm oasis with great chai and desserts aplenty. We loved their chai collection. Although their food menu is quite limited, they have some decent bites too. Do try their Peanut Butter Nutella Sandwich and gorge on their Walnut Cake with caramel fudge. From the teas, their Chinese tea collection is stellar and although we didn’t try it ourselves, they highly recommend their masala chai. This place is great for those looking for a spot to settle in with their laptops. They have working internet and it doesn’t get too noisy.